Here at Motor Boatin LLC, we are proud to offer Yamaha Waverunners to our customers for Jet Ski rentals. We have Yamaha Waverunners that are the VX Deluxe model. Each Jet Ski can hold up to 3 people at a time, but there are many other reasons why this has become our Jet Ski model of choice. Yamaha Waverunners were first introduced in 1986 as the world’s first tandem Jet Ski, and Yamaha has worked tirelessly to improve the reliability, fun and function of these superior personal watercraft ever since. Reliability: The engineering and quality control of Yamaha sets the standard for the whole personal watercraft industry. These Jet Skis require relatively little maintenance due to their years of small engine expertise. Fuel efficiency: High fuel efficiency saves you money and means that your day of adventure has a small environmental impact. Assembled in the USA: We are proud to use a product that is assembled here in America. Easy-to-understand controls: It is easier to go forward and in reverse with Yamaha Waverunners than some other Jet Skis. All the controls are on the handlebars, and there is even an anti-lock braking type feature that will help you stop quickly without getting thrown over the handlebars. Yamaha Waverunners are used extensively for recreation, but they are also the Jet Ski of choice for many rescue and patrol uses. They are good for people new to Jet Skis, but they are also sure to give Jet Ski veterans a fun ride every time. The fall season means the air is growing a bit colder and the leaves are changing to beautiful shades of yellow, orange, and red. With the intense heat of the summer dissipating, the fall weather makes it ideal for a great weekend at the lake. Our team at Motor Boatin’ off of Falls Lake has noticed that fall is a much better time to go out on the water. It’s not too hot outside but the cold doesn’t stop you. There are many activities to do when taking a weekend trip to the lake. Fishing: The fall season is a great time to go fishing with friends and family. It can also be a great time to take the boat out for one last spin before the cold weather sets in. And if you don’t have a boat, don’t worry, there are rentals available at some locations. Whether you’re a seasoned pro at fishing or you just like to fish for fun, it’s a great weekend activity for people of all ages. Hiking: With all the leaves changing colors, it’s one of the most beautiful times of the year to take a nature hike. Many parks and recreational areas have scenic trails that wind through the forests. And if you’re an animal lover, you can bring your dog along for the hike and maybe see some other animals along the way. Picnic: Picnics are great to have year-round. Friends and family can get together for a picnic at the lake one weekend to enjoy the fall weather. It’s a nice activity that many will enjoy. With the fall season, a Thanksgiving-themed picnic would be a good bet. There are all kinds of foods that can be made for a picnic and potluck style picnics are even better. Camping: After a long day of activities, you, your friends, or your family can spend a night under the stars. The weather is perfect for a campfire to keep everyone warm. Gathering around the fire, telling stories, and catching up are all things that can be done while camping at the lake. In addition to roasting marshmallows, you could also roast any fish caught while fishing on the lake that day. The fall season is a great time to do many different outdoor activities. It’s not too cold and it’s not too hot and there are activities for everyone to do at the lake. 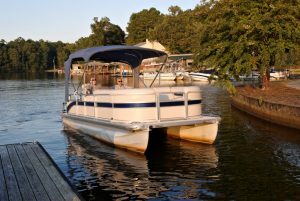 If you want to take a trip to the lake before winter sets in, rent a boat from Motor-Boatin’ Recreational Boat Rental! Riding on a Jet Ski can be one of the most exhilarating things to do on the water, but it can be dangerous if you don’t know what you’re doing. The good news is that most Jet Ski accidents can be avoided when you follow a few simple safety guidelines. Everyone should have a life jacket: Regardless of age or swimming ability, everyone is safer with a life jacket if it fits properly. Double check the fit of life jackets intended for children. Consider wearing a helmet: A helmet specially designed for use on the water provides the best protection if you get ejected from your Jet Ski or if there is flying debris from a boat or some other source while you’re on the water. In some states, children are required to wear helmets. Watch your speed: Make sure you keep proper distance between your Jet Ski and other watercraft in the area. Remember that you need room to stop if it becomes necessary. Use common sense and obey any speed guidelines for the area you are in. Stay sober: Alcohol reduces your coordination, reaction time and can impair your judgement. Don’t drink if you are going to be on a Jet Ski. Taking proper care of your Jet Skis is another important component to staying safe on the water, but if you rent your Jet Ski from us here at Motor Boatin LLC, you can rest assured that we have taken care of that for you.